this wonderfull song makes me even more wish to travell around the world. Those who do not understand italian just see the english translation. 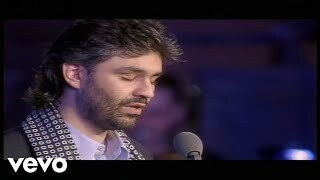 Even you might not understand Italian you can still feel the power in his voice and in his soul, which justs makes you understand and appreciate beautiful music! Jazz: You're the idiot here. Con te partiro translates into will go with you. Time to say goodbye is the title of the part-English version that Bocelli originally sung with Sarah Brightman. Such a beautiful song. Part of my family's from an Italian background but I don't speak the language, but either way, it's just beautiful. The debate over the translation reminds me so much of meglio stasera from The Pink Panther. I am far from fluent in Italian, but even the basics are enough to obviate the difference. Beautiful song, first song i ever listened and it took me to an unknown place. i fell in love with italian music because of it.